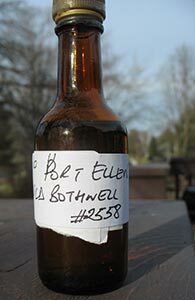 This rattty sample bottle contains 50 ml of the sixth annual release of Port Ellen from 2006 (distilled in 1978). Actually, let me be exact: this contains 50 ml of the 200 ml release of this Port Ellen from one of Diageo’s sampler packs. This version was at 54.3% to the regular bottle’s 54.2%. Both were released well before the world went insane, when these annual releases were well within the reach of average punters, all the way through the 9th release—the innocents that we were, we complained then too about how expensive these were compared to regular bottles. I’ve had this sample of Port Ellen from a single sherry cask sitting around for a couple of years now—I’ve no idea why I haven’t reviewed it yet. The Whisky Exchange bottled it in 2011 to commemorate the marriage of Beyonce and Jay-Z. It’s a little odd that they did this three years after the fact but maybe they were waiting to see if the marriage would stick. It is an odd choice of distillery to commemorate a wedding though—you’d think they’d pick one that’s still a going concern, not one that had to be shut down. Maybe Sukhinder Singh is more of a Nas fan? Port Ellens from the last couple of years of the distillery’s life don’t have quite as high a reputation as those distilled in the 1970s but I quite liked the one I previously reviewed (this one from Old Bothwell). Let’s see if this one is as good and if it does the royal couple proud; and if it makes me regret not purchasing a bottle when it was released—I’m not sure how much they asked for it back in 2011 but doubtless it was a fraction of the current going prices for Port Ellens of any quality. This is, I’m pretty sure, the youngest Port Ellen I’ve had (this 21 yo is the youngest I’ve previously reviewed). This was released in 2000, one year before the first annual release; in other words, before Port Ellen was quite Port Ellen. 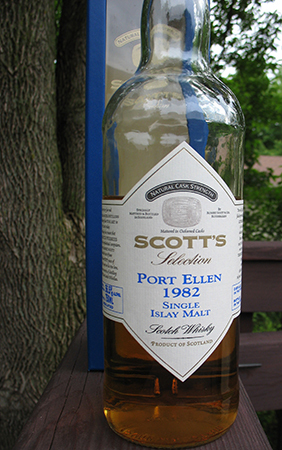 As you may be tired of being told (and I’m sure I’ve said it many times before myself), Port Ellen was a workhorse distillery when it was operational and almost no single malt version was released until the the mid-late 1980s (after it had closed) and it wasn’t until the late 1990s and really the early 2000s that it became widely known and it’s now iconic reputation sealed. So someone who bought this bottle when it was first released probably did not pay very much more for it than they would have for whisky of similar age from open distilleries and would probably have thought you were kidding if you’d told them then that 15 years later the entry-level price for Port Ellen would be well north of $500. 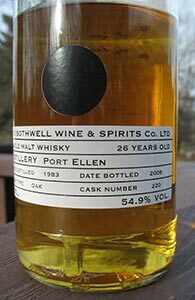 Another Port Ellen from the early Old Bothwell releases of a few years ago. This one is from 1982, the year before the distillery closed for good. I do wonder if anyone has cracked the mystery of how it is that Old Bothwell happened to have all these casks and why it is we don’t see anything else from them. Did Diageo have them whacked? Anyway. Let’s get right to it.